Does it seem arbitrary to prefer typing certain letters on a keyboard over others? A new study out of the University College of London suggests that a predilection for keys found on the right side of the keyboard is not merely a phenomenon of modern mediums, but an organic extension of sifting sense through our fingers. Published in the Psychonomic Bulletin & Review earlier this year, the study included three experiments in which subjects were asked to rate words on a nine-point scale based on how pleasing those words were to type. The first experiment, using common English, Spanish, and Dutch words, led researchers to a small but significant correlation: Words that required typists to utilize the right side of the keyboard more than the left tended to elicit more positive emotions. 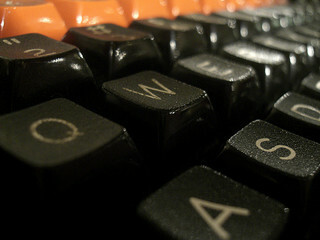 In the second experiment, researchers drew from a bank of words that came into existence after the invention of the QWERTY keyboard. Here, they found an even more significant preference for right-side words, suggesting perhaps that we are more accustomed to writing neologisms rather than saying them, thus allowing new words to develop in accordance with the right-side preference. Finally, researchers tested the “QWERTY effect” with pseudo-words to determine if typists prefer right-side words even when there is no lexical underpinning for that preference. Results were in accordance with the first two experiments. While the study marks only the beginning of research into how key placement may influence our perception of the words we type or see on a screen, the principle behind the “QWERTY effect” is ubiquitous. The concept of fluency, developed in the 1960s, has been applied to most every verbal or tactile aspect of language to show that humans prefer information that is easy to process. Numerous experiments have suggested that we disfavor girls with boys’ names and boys with girls’ names, that we’ll vote for the political candidate with the more easily-pronounced surname in simulated elections, and that we believe an individual’s name can influence everything from salary to marriage prospects. In this context, it seems far from preposterous to suppose that the rapping of our fingers on a keyboard is reflected in the feelings we associate with the words those movements produce. Utter tosh! Why don’t these people get a life, and go out and earn a proper wage instead of dreaming up way-out theories probably at the taxpayer’s expense in terms of university research funding. The arrangement of the typewriter keyboard was worked out over a hundred years ago on a letter frequency basis. Leave it alone! ^^ Wow, what a grump. ^^ But what I wanted to ask was, what about left-handed people? Seems they would have a preference for words on their dominant side.